I have finally finished my entry into the Etsy Bead Weavers monthly challenge for May. I was super please with the outcome, and so was the lady who made the original seahorse stamping!! She is actually using a picture of it in her listing to show people what they can do with her amazing work!! Check out Claudia's shop as she has AMAZING items for bead embroiderers in there!! So here is the finished necklace!! I'm hoping to actually get some votes this month as I put A LOT of work into this piece. 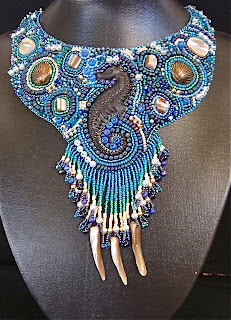 It features Swarovski pearls in 3 different colours and sizes, heaps of Swarovski bicones to imitate the sparkle of the water, natural shell beads, shell buttons thousands of seed beads and of course the beautiful Patina'd steam punk seahorse from Calliopes Attic!! Although this isn't the best picture of the necklace it gives an idea of where it would sit, and it drapes beautifully!!! I feel extremely honoured at the moment as I have been asked to join in in "The Battle Of The Beadsmith"
This is an elimination based competition involving 80 of the worlds best bead artists. On May 15th the first pairing of competitors will be announced and then everyone will have 7 weeks to come up with an original piece of work!! It's very flattering and overwhelming as this competition includes a lot of my idols Whether they be judges or competitors!! I am also glad to announce the winner of my ring giveaway Is Kristen!! Congratulations Kristen and if you could get in touch with me at jobrowne@live.com.au with your address so that I can send it out to you!! Don't forget about my mothers day sale going on at the moment. With only 3 weeks until Mothers Day if you would like one of my OOAK bead embroidered items at 20% off you'd better get in quick!! Congrats Jo on your invitation! You definitly deserve it, your work is amazing. I think You'll fit right in with all the big names! LOL! I am so excited about the Battle and I'm not even beading! You do deserve it! Your imagination and what you can make the beads do is amazing! I am proud to know you! Thank you Thank you Thank you I am super excited that I will have my own Joanne Browne Original!!!!!! !